“A choreographer who knows what he wants to say and can put this effectively and succinctly”, is what one critic wrote after Hubert Essakow’s latest world premiere in London. ‘Ignis’ was hailed as “incredibly moving”, The Guardian described it as a “melancholic, beautifully-orchestrated dance drama” which “still burns in the memory”. While by no means restricted to the vocabulary of traditional danse d’école in his choreographic language, the South African’s career had a classical beginning. Hubert Essakow spent ten years with the Royal Ballet in London, ultimately dancing as a soloist in works by Kenneth MacMillan, Frederick Ashton, George Balanchine, Christopher Wheeldon, Siobhan Davies, Twyla Tharp and William Forsythe. After leaving the prestigious company in 2003, Essakow spent some time living in Japan, continued his training in contemporary dance and – on returning to his chosen home in Great Britain – danced with companies such as the Ballet Boyz or the Rambert Dance Company. At the same time he also began planning his own work and made a name for himself in fringe theatre. He had already begun working as a freelance choreographer and teacher for Sadler’s Wells, the Royal Academy of Dance and ROH2, the contemporary programming strand of the Royal Opera House in London. 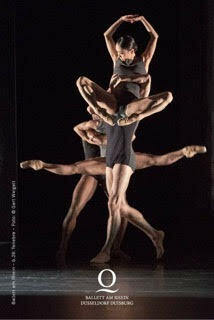 He has also collaborated with the English National Ballet. Martin Schläpfer has now discovered this versatile choreographer for the Ballett am Rhein and commissioned a new work by Hubert Essakow for his ensemble. To music by Bryce Dessner and sounds by Gareth Mitchell Hubert Essakow will create a journey from darkness to light inspired by the christian religious service “Tenebrae”. He will be joined by Merle Hensel, whose unconventional designs for dance, theatre, opera and film arouse much curiosity in common with the work of London-based lighting designer Mark Doubleday.